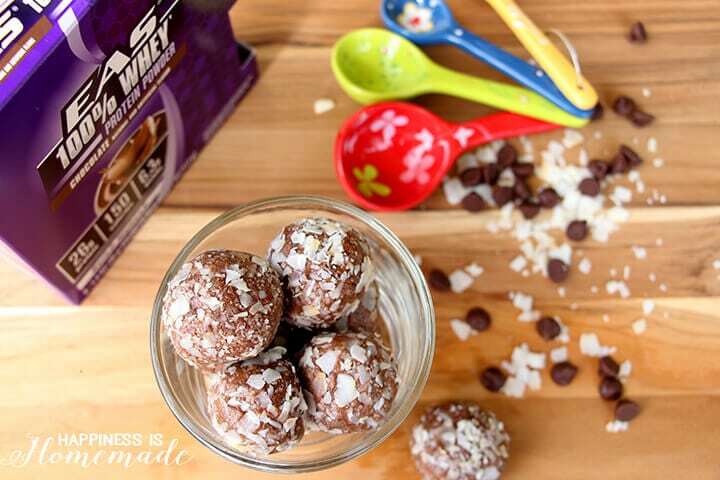 This no-bake chocolate coconut protein ball recipe packs a ton of healthy ingredients and delicious flavors into a tasty bite sized treat! When I find myself struggling to get enough protein in my diet, I like to whip up a batch of homemade protein bars or energy bites for snack time. 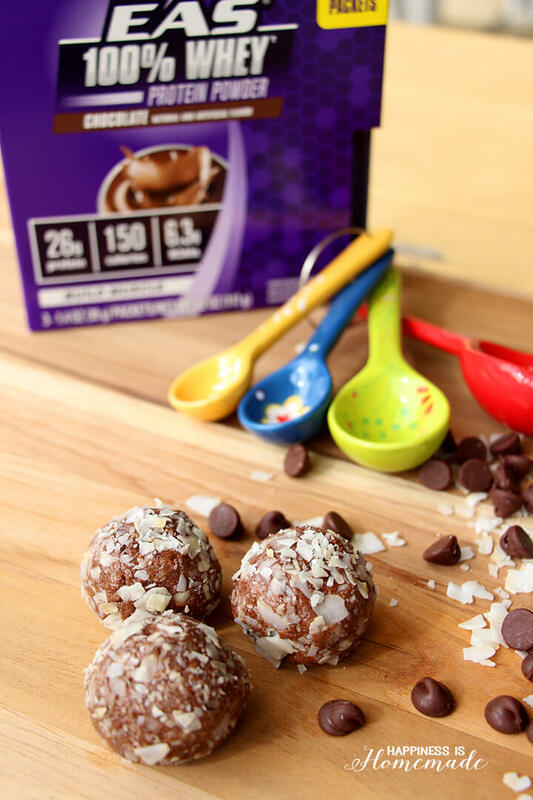 These chocolate coconut energy balls are sweet enough to pass as dessert, but they also make a great on-the-go breakfast option. Honestly, they’re perfect for ANY time of day! 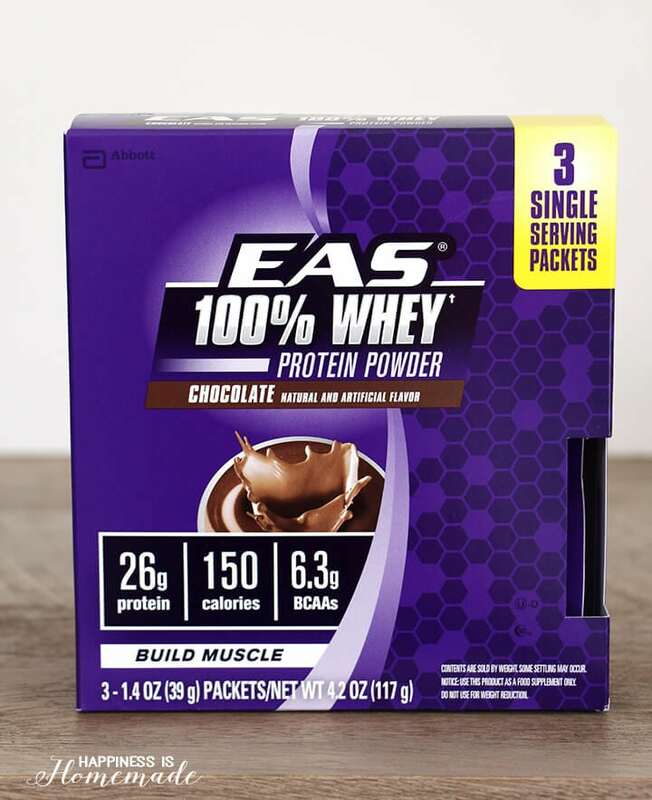 EAS 100% Whey Protein Powder is a deliciously simple yet effective way for active individuals to add more protein to their diet, and it is available in a handy single-serving package so you don’t even need a measuring cup for this recipe (EAS is 10% off right now at Target + there’s a 5% Cartwheel discount as well!). 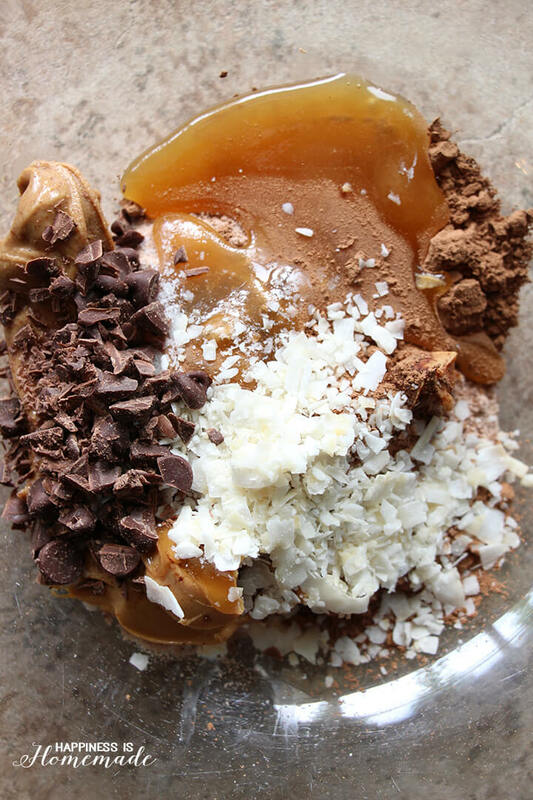 Pour the contents of one chocolate protein powder packet into a bowl along with almond butter, peanut butter, unsweetened cocoa powder, raw honey, unsweetened shredded coconut, salt and chocolate chips. 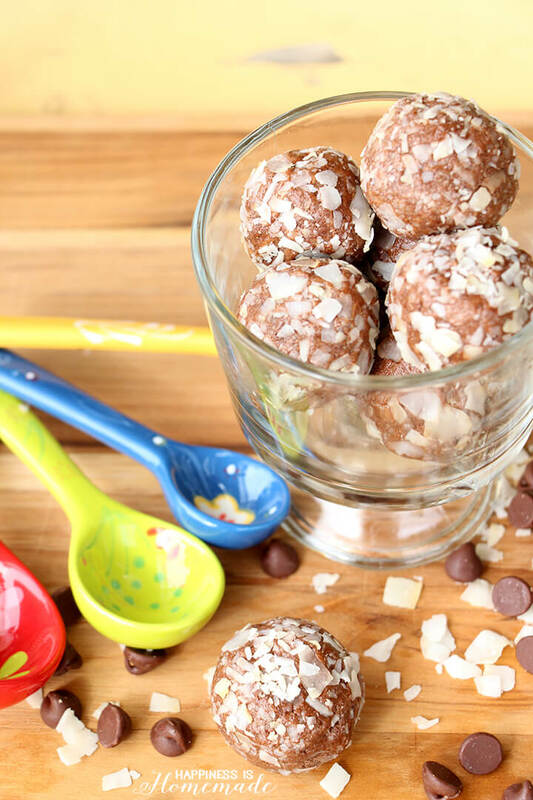 Use a large spoon to mix everything together, and then roll the mixture into balls. 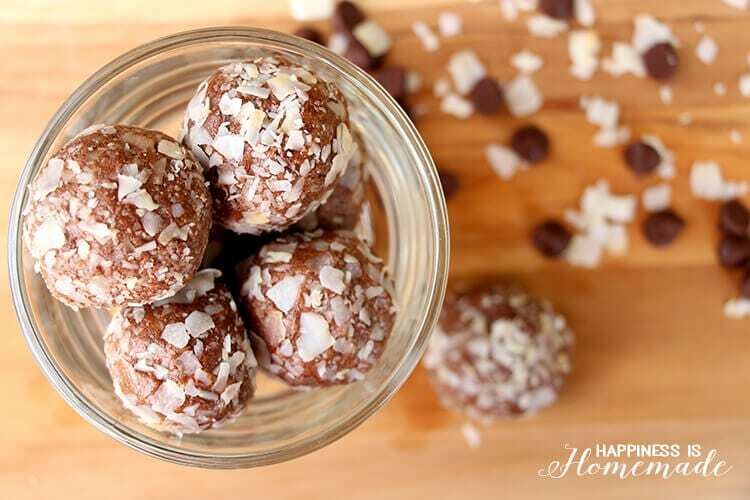 Finish by rolling and coating each ball in the reserved coconut flakes. Roll into balls approximately 1.5" in size. 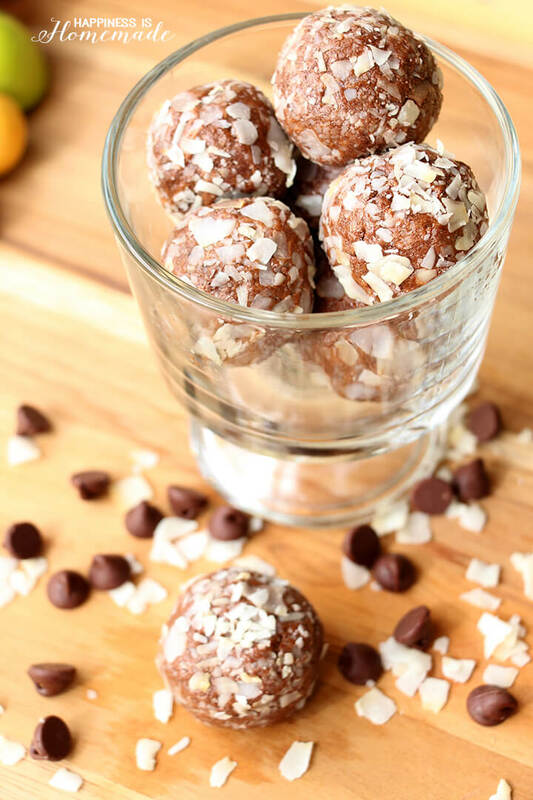 These little energy balls always give me a boost, and they help to ensure that I’m meeting the protein requirements for our active lifestyle. These energy bites can be eaten as soon as they have been shaped, and leftovers can be stored in the refrigerator for up to a week. They will be soft set immediately after mixing; however, they take on a brownie-like texture after they have been refrigerated, so I usually eat mine straight out of the fridge. YUM! For more ways to #DoMoreWithProtein, visit the EAS website where you can learn about weight management, strength and performance, and everyday fitness along with lots more delicious recipes! You had me at individual serving sizes. 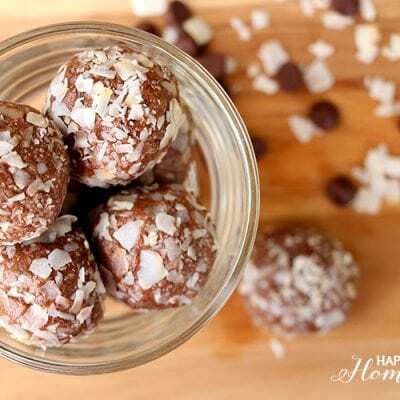 I’m going to make these for my teenager, he’s been so busy with school and baseball, he needs a treat that will keep him going!